School Library Journal - 09/01/2017 Gr 4–8—Helping her parents with their jobs at the Renaissance Faire is all 11-year-old homeschooler Imogene "Impy" Vega has ever known. While working with her family is fun, she wants to go to middle school and meet kids her own age. 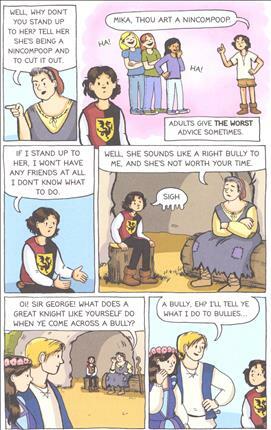 Unfortunately, sheltered Impy is ill-equipped for the realities of draconian teachers, frenemies, and boys. Her new challenges begin to wear her down, and she struggles to develop empathy for others, even in the midst of adolescent angst. This utterly charming graphic novel rivals the author's Newbery Award-winning debut title, Roller Girl. Whereas in the earlier book Jamieson subtly incorporated elements of realism (wrinkles, scuffs, and scrapes on the characters), here she has committed to a more unified cartoonlike look, with fewer details and sketchlike lines. The result is a slightly more polished work. Exaggerated character expressions add further to the appeal. This is a lengthy coming-of-age story that weaves in subplots involving Impy's first real friend, her younger brother, and other cast members of the Faire. Tweens seeking a light read with a quick payoff will shy away, but those who enjoy weightier narratives will lose themselves in Jamieson's world and appreciate the realistic life-goes-on conclusion. VERDICT As heartfelt as it is gorgeous, this is a worthy addition to any middle grade graphic novel collection.—Matisse Mozer, County of Los Angeles Public Library - Copyright 2017 Publishers Weekly, Library Journal and/or School Library Journal used with permission. Booklist - 09/15/2017 After years of homeschooling, Imogene is excited to start public school for the first time. Plus, she finally gets to perform in the Renaissance faire, where her mom has a shop (or, shoppe) and her dad plays a knight. Imogene doesn’t have much trouble sliding into her new role at the faire, but middle school is another story. Rules about who to sit with, what to wear, and how to fit in are confounding, especially when she’s getting some seriously mixed messages from the popular girls in her class and realizing how different her family is. 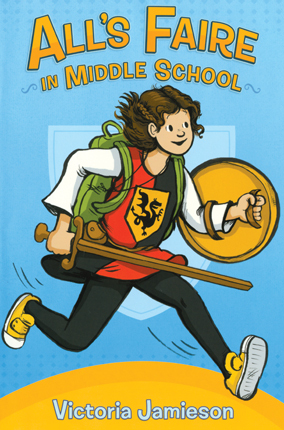 Jamieson’s appealing, naturalistic artwork, full of warm tones, realistic-looking characters, and saturated colors, playfully incorporates medieval imagery along with Imogene’s more mundane homelife, particularly when Imogene fears that her misbehavior at home, thanks to frustrations at school, makes her more of a dragon than a knight. Jamieson masterfully taps into the voice and concerns of middle-schoolers, and the offbeat setting of the Renaissance faire adds some lively texture. Kids who loved Jamieson’s Roller Girl (2015) will adore this one, too. - Copyright 2017 Booklist.